We’re bad at big family announcements, and we have a policy of – despite being a highly-connected, digital household – trying to keep our kids off of the internet and social media. But I can’t really keep a blog and then NOT post about such a massively life changing event as the arrival of a new child. So please join me in welcoming Ada Isabel Wintle to the world. 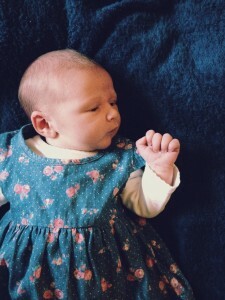 She was born on 31st January weighing 8lb 8.5oz. We think you’ll agree that she’s a beautiful little girl, and we’re chuffed to bits. We’ve had slight feeding issues, but generally she is a peaceful, happy, healthy little girl. She’s easily put-downable and pass-aroundable, and she sleeps really well. ‘Ada’ means ‘noble’ or ‘joyful’. Ada seems to be living up to her first name, much as Isaac did. I’m sure it’s co-incidence, or cognitive bias, or something explainable, but I like to think that somehow their soul becomes what their name implies. ‘Isabel’ means ‘pledged to God’, but is also derived from ‘Elizabeth’, which is Sally’s mum’s name, and Sally’s own middle name. So it’s both meaningful and has a family tie. People will inevitably ask: did you name her after Ada the world’s first computer programmer (sort of)? And the answer is that we didn’t really name her after Ada Lovelace, but her name was definitely inspired by Ada Lovelace. And I, personally, love the geek factor in that! I’m massively proud of my Sally who’s an incredible mum. And my boy, Isaac, has stepped into the role of big brother magnificently. It’s a bit relentless with two kids. But we’re actually doing really, really well. I hope you get to meet her soon!